We’re all pretty busy people. Many retirees have told me they thought they’d have more time to relax. However, quite the contrary, as they find themselves busier than ever. Students have homework and after-school jobs. We have our places of employment that keep us on our toes. There are commitments for which we’ve obligated ourselves. Nuclear and extended family matters are always first and foremost and must be attended to. Oh yes, there is laundry that needs cleaning, the house that needs attending to, meals to be prepared, in due season there are lawns that need mowing and sidewalks that need snow removal, gardens that need tending and repairs that cannot wait any longer. I get tired just thinking about all that there is to do. However, I’m more excited and more eager than ever to “put shoulder to the wheel” and get the entire parish community involved and engaged in this most sacred effort of building a stronger, healthier and spiritually alive St. Nicholas Church. Of course, there are church matters that request of us our time, our talents and our occasional treasures, too. There are ministries that need our service; a building that needs our care; people that need our love and attention and a God who deserves and welcomes our worship and praise. Is there enough time for all of this? There must be. We’ve been doing it for many years and the Community of St. Nicholas is a wonderful example of people joining together and making things work and happen…and we do so, always, for the glory of God. This Sunday, Feb. 12th, we have our Annual Parish Meeting; a yearly event that is a parish requirement. Trust me; it’s not as if I look to create more meetings, because I’m bored or have some devilish side to me. The reality is, this Annual Parish Meeting is the prime time of the year for all of us, each member, to share our feelings, thoughts and ideas as we work, together, to help build and strengthen our community of faith. St. Nicholas is only as strong as we are willing to share, give of ourselves and work side by side with one another. The truth be told, I look forward to this meeting…because it is a wonderful vehicle for us, to talk, listen, laugh and share ourselves with the entire community. We gather and share because we love this place and we wish to honor and praise God our Creator and Jesus, the Redeemer. Last year’s meeting was a blessed success. People came, listened, shared thoughts and opinions, and had a friendly meal. And the beneficiary of all this was St. Nicholas Church and the beautiful people who worship within the walls of this special place. Again, we are only as strong as we are willing to share, give of ourselves and work side by side with one another. I pray we are all willing. I pray our determination and desire is sustained and strengthened, for the building of God’s Kingdom is no sprint, but a marathon. The race is long and demanding. Yet, together, there are no obstacles too great or too daunting to impede our progress and our collective efforts. 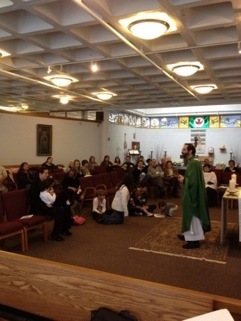 So, my dear sisters and brothers: Sunday, February 12th, 2012, after the 10 am Liturgy in Holy Innocents Hall at St. Nicholas Episcopal Church…we gather, we share, we eat and we celebrate. Bring your voices, your thoughts, your ideas, your patience, your casseroles and your appetite, too.